Steriliser Services are proud to offer a new range of Bedpan Washer-Sanitisers to the New Zealand market. The SS WASHBOX series is fully designed and made in NZ and is uniquely suited to applications in both CSSD & Healthcare Environments. The unique feature of the ss WASHBOX sanitiser is that it uses a PLC controller. A PLC is specifically an industrial type controller (via 2 line digital display) that is very suited to a sanitiser. PLCS operate very reliably in environments with high temperature & high humidity.We use an Omron PLC that is manufactured in Singapore to the highest standards available. Fault-finding is easy , as the machine can connect with a PC and then fault can be located. Customisation and calibration can be achieved simply ,by changing the parameters on the touch screen. 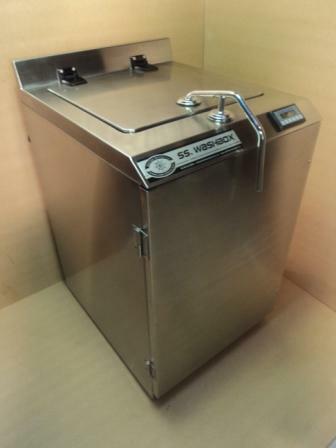 The washbox is top loading for ease of use .With one touch of the start button, the cycle starts and continues through to completion automatically, guaranteeing a clean and sanitised bedpan. To prevent cross infection , the sanitisation cycle MUST be completed before the door interlock will allow the door to be opened. You can choose your own service provider /inhouse Engineers for maintenance , as PLCS are easily worked on -there is no exclusive program knowledge or agent required.Parts are available locally -no waiting for overseas shipments. The SA 3002 sanitiser usesa high volume impeller to wash and sanitise 4 bedpans at ones in a cycle that takes 18 MINUTES TO COMPLETE. ‘Door open’ button is pushed and lid opens. Lid is closed and locked.’Cycle start’ button is pressed. Lid button can now be pressed and lid opened. Manual interlocked top loading hinged door.